With all the hustle and bustle of the holiday season, it can be easy to get to a point of flinging your hands in the air, throwing caution to the wind, whipping out the plastic and telling yourself that you’l deal with it when the holidays are over. There is always so much to do and not enough time to get it all done, and trying to be thrifty, well, who has the time for that this time of year? While it may feel overwhelming, or even almost impossible, there are easy and practical ways to save during the holidays. Small savings here and there can add up to a less stressful January. Here are some simple steps that you can take to have a debt-free holiday season. I’ve said it before—planning ahead will always keep you on track. By taking even just a few minutes to talk about your family’s goals, needs and expectations for the holidays can save you both time and money. Make a list of everyone that you need to shop for and figure out what you’ll buy for each person. Don’t allow yourself extra room in your budget by bringing your credit cards with you when Christmas shopping. 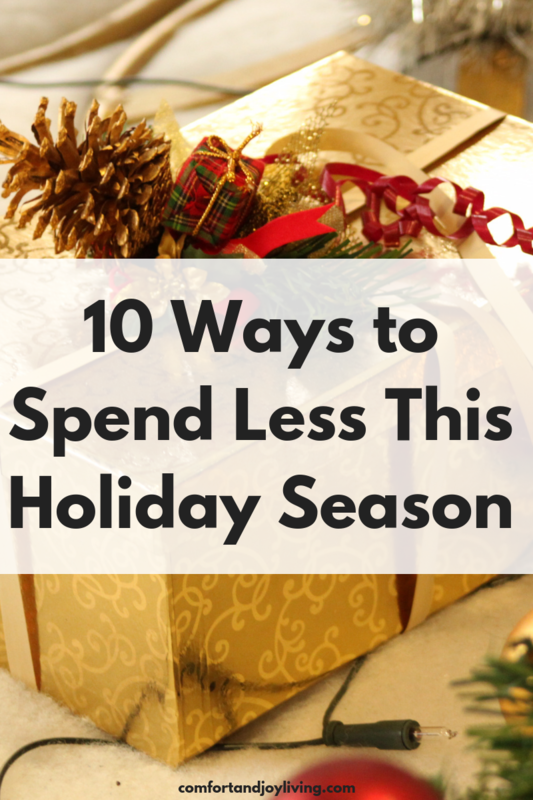 While this may seem very limiting—what if you don’t bring enough money or you decide that you need something else while you’re out—bringing cash is the best way to ensure that you don’t go over your Christmas shopping budget when facing those Christmas bargains. Before you head out shopping, check out coupon and cash back site to save even more money. Use eBates to get cash back by shopping at any of their participating retailers. Take a look at RetailMeNot or CouponSherpa for coupon codes that you can use to lower the prices of items that you want buy. Buy discounted gift cards to use toward your purchase through sites like GiftCardGranny.com. You purchase a gift card for lower than the face value, but still have the same amount to spend. For example, you may find a $100 gift card priced at just $80. You pay $80, but still get $100 to spend. That’s $20 of free money in your pocket! With the many deals and codes that are available, you can often get a better price when you shop online. The savings is not always about money, it’s also about saving yourself time. Think of it like this you don’t have to get dressed, drive to the mall, fight the crowds, stand in long lines, and drive back home. Your time is worth something. Many sites offer discounts and even free shipping this time of the year. Some sites don’t even charge sales tax—depending on where you live. So you can save not only fuel and time, but possibly even sales tax. Check out rebate sites, such as Ebates, which pay you a percentage of your purchase back. You can also use Paribus which watches your purchases for price drops and pays you back if the price drops within a few days after you shop. Many think of gift cards as an easy way out of buying a gift. That isn’t true. any would rather receive a gift card so that they can purchase what they want, rather than stand in long lines to return something that they don’t want. It not only helps your recipient, but you as well. You can’t overspend when you get a gift card. If you budgeted $25 for someone, you simply purchase a $25 card and you stay on budget! To save even more money, buy your gift cards at a discount at sites such as giftcardgranny.com. In addition, make sure to take advantage of bonus gift card offers as well where you get a free gift card for yourself when you purchase another. This is an easy way to get a smaller gift card for someone on your list—for free! One of the best ways in which you can stretch your budget is to make your own gifts. Handmade gifts are not only cost effective, they’re usually much more appreciated than some mass market item from the store. For some great ideas, check out ideas on Pinterest. There are so many ideas, such as personalized mugs, food jar gifts like soup and cookie mixes, to spa gifts like bath salts and hand scrubs. Don’t underestimate the sentiment and meaning of a handcrafted gift. There are so many activities during the holidays—from plays, pageants, ice-skating and holiday-themed entertainment, you entire budget can easily be spent on just a few activities. This year, try to focus on spending time as a family. Watching movies on Netflix or planning an evening around an TV. airing of a favorite Christmas movie. Check out your home video collection and have each family member pick a favorite. Pop some popcorn, make some hot chocolate and have a movie marathon. Not only will you avoid the high movie theater prices, but you won’t be fighting the crowds, pay a fortune for snacks or listen to other movie patrons talking during the show. Another great idea is to check out 12 holiday-themed books from the library and read a different book as a family each night, or take out a Christmas classic and read a chapter each night on a countdown to Christmas. While you’re cuddling under the covers reading these stories to each other, I guarantee that you’ll feel the spirit of the season. Bring out the board games one night, a deck of cards, or even puzzles. Family memories are made through simple times. Just getting everyone to look up from their screens and interacting with each other and having fun can really be the highlight of the season. Big family dinners can get expensive fast, especially if you’re not paying attention. Taking time to plan your menus in advance and stock up on food when it’s on sale will really help in keeping costs down. When making your holiday dinners, try to shop your pantry and use ingredients that you already have. Also, keep in mind that you don’t have to use a brand name product if you’re putting it in a recipe. No one will be able to tell once it’s cooked. Just buy what’s on sale and what you have coupons for and know that you don’t have to go all out. I don’t know about you, but I love to bake a lot for the holidays. Fortunately, with all the great grocery sales that they have this time of year, baking can one of the best deals of the season. Make sure to stock up on flour, sugar and other basics as they go on sale. It doesn’t have to be real fancy—trying making classic recipes like sugar cookies with sprinkles—they’re often quite inexpensive to make and can really stretch. If you’re hosting a party, consider having a potluck and have your guests pitch in. Alternately, you can have a soup, potato or taco bar with an inexpensive base and give everyone a hearty comforting meal and enjoy a festive—and frugal—get-together. Between Pottery Barn, Crate & Barrel and Martha Stewart, we can sometimes tend to go a little overboard on decorations and feel the need to top the year before. Get back to the basics by using simple items to decorate—use items from nature such as pine cones and greenery and place them in vases and large jars. Scent your home with a few drops of cinnamon or pine essential oils. You can also have your kids make some decorations by stringing popcorn, cranberries and making paper chains. If you didn’t shop the sales last year, you can stock up on a few Christmas items this year after the holiday is over. You can get 50-75% off from the first day after the holiday and the savings stack up from there. If you’re in the market for a faux tree, ornaments or Christmas lights, post-Christmastime is a great time to do it and you’ll thank yourself next year. Instead of stressing over buying gifts for friends and family, why not agree to forgo exchanging gifts in favor of having a coffee date after the holidays when things have calmed down? Chances are that the promise of spending time with a friend and enjoying each other’s company and catching up will mean more than a gift ever could. You can write a letter to someone special, thanking them for what they have brought to your life. Make plans with your spouse to spend an afternoon together going for a bike ride or a hike, or even window shopping as your gift to each other. Walk while holding hands and enjoy each other’s company. Encourage your kids to give acts of service. Shoveling a neighbor’s sidewalk or sprucing up someone’s yard or home can be a nice gift. Siblings can help with homework or help clean each other’s rooms, or other things that siblings can do for each other. It may sound a little Scrooge-like, but kids don’t really need more than one toy for Christmas. One special item an educational toy or treasure can be just as meaningful as three Barbie dolls, a bunch of action figures or several pieces of Littlest Pet Shop that will probably be lost in a few weeks anyway, and a few well-chosen items will get more use than a big pile if the latest “hot” toys. If your family chooses to give gifts from Santa, have the special gift come from him. Parents can fill in with clothing, books and practical gifts that kids will need and continue to use throughout the year.